Gerry Adams has written to Enda Kenny asking for the Dáil to be recalled. SINN FÉIN PRESIDENT Gerry Adams has written to the Taoiseach asking for the Dáil to be recalled to discuss the crisis in Gaza. Adams has written to Enda Kenny asking for the Dáil to be recalled in light of the Irish government’s decision to abstain in a vote on an emergency debate at the UN on Wednesday. Fianna Fáil has also called for the Dáil to meet to discuss “the appalling situation” in Gaza and wants TDs to debate the crisis in Ukraine as well. The call comes a week after Sinn Féin failed in its attempts to secure a special Dáil debate on the Gaza crisis but managed to force TDs to stand for a moment in solidarity “with the people of Gaza and the Middle East”. 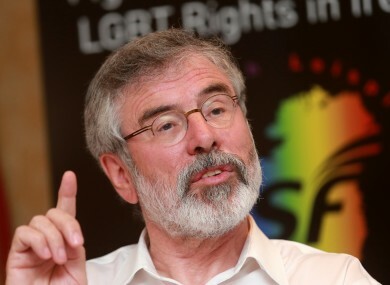 There was no immediate government response to Adams’s request this afternoon. “The resolution, which the Government refused to support, sought to establish an international Commission of Inquiry into violations of human rights in Gaza,” Adams said today. Sinn Féin, which is prominently pro-Palestinian, claims it has the support of several other TDs including Fianna Fáil’s Dara Calleary and independents Peter Mathews, Clare Daly, Finian McGrath and John Halligan. He added that TDs should also discuss the crisis Ukraine saying the region had destabilised considerably since the Dáil broke last week and he wants to hear the government’s plan of action. Fianna Fáil said that a Dáil recall is at the discretion of the Taoiseach. A spokesperson said the party has written to the government chief whip seeking for time to also be made available to discuss the Ukraine crisis and the killing of the passengers of Flight MH17. Labour figures have become increasingly critical of Ireland’s stance in relation to the crisis. A government spokesperson could not immediately be reached for comment this afternoon. Email “Sinn Féin and Fianna Fáil want to call TDs back from their holidays to talk about Gaza ”. Feedback on “Sinn Féin and Fianna Fáil want to call TDs back from their holidays to talk about Gaza ”.